The Kasa-Obake or Karakasa is probably the most famous yokai. 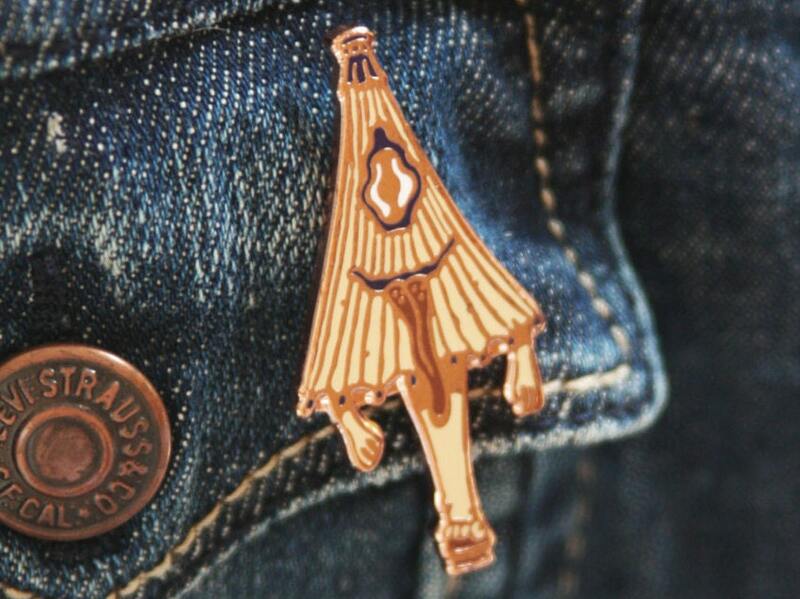 This pin features a pale yellow version of the famous ghost of the forgotten umbrellas: one blue eye, a dangling tongue, small arms and a single leg with a wooden shoe. 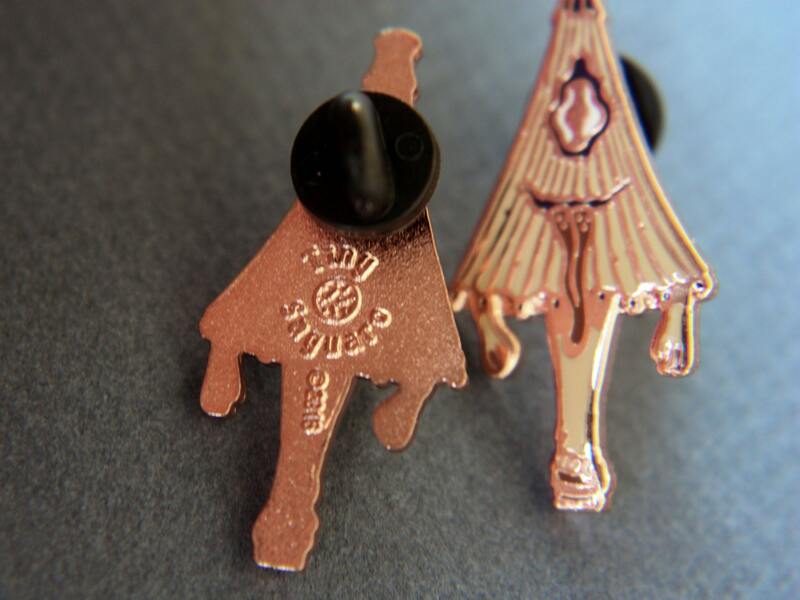 So if you are used to losing your umbrellas and you want to be forgiven, go for this original and elegant Karakasa pin. 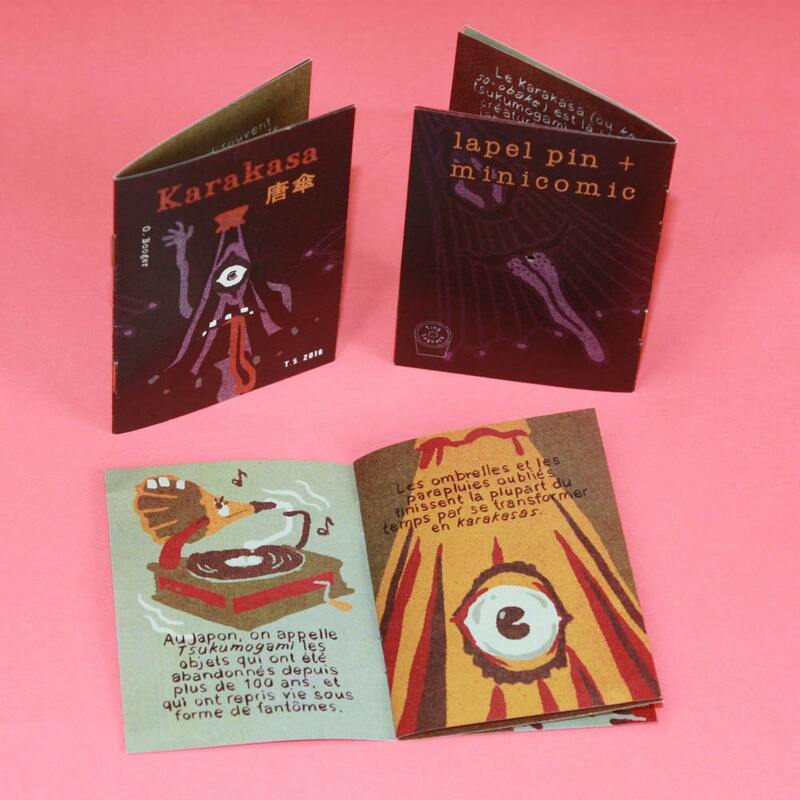 Like all other Tiny Saguaro pins, Karakasa comes along with a 8 pages minicomic (in French). Also included : a hand printed numered card. They are generally umbrellas with one eye and jump around with one leg, but sometimes they have two arms or two eyes among other features, and they also sometimes depicted to have a long tongue. Sometimes, but rarely, they even have two feet, as depicted in the yōkai emaki such the "Hyakki Yagyo Zumaki." In the Hyakki Yagyo Emaki from the Muromachi period, yōkai that appeared as umbrellas could be seen, but in this emaki, it was a humanoid yokai that merely had an umbrella on its head, and thus had a different appearance than that resembling a kasa-obake. The kasa-obake that took on an appearance with one eye and one foot was seen from the Edo period and onwards, and in the Obake karuta made from the Edo period to the Taishō period, kasa-obake with one foot could often be seen. In the yōkai sugoroku "Mukashi-banashi Yōkai Sugoroku (百種怪談妖物双六)" the Ansei era, a kasa-obake was depicted under the name "One-footed from Sagizaka (鷺坂の一本足 Sagazaka no Ippon Ashi)." Among the many non-living or still object yōkai depicted in the "Hyakki Yagyo Emaki," only the umbrella yōkai can be seen to have remain well-known even after the Edo period, and it is said to be the most well-known yōkai of an object. Love him! 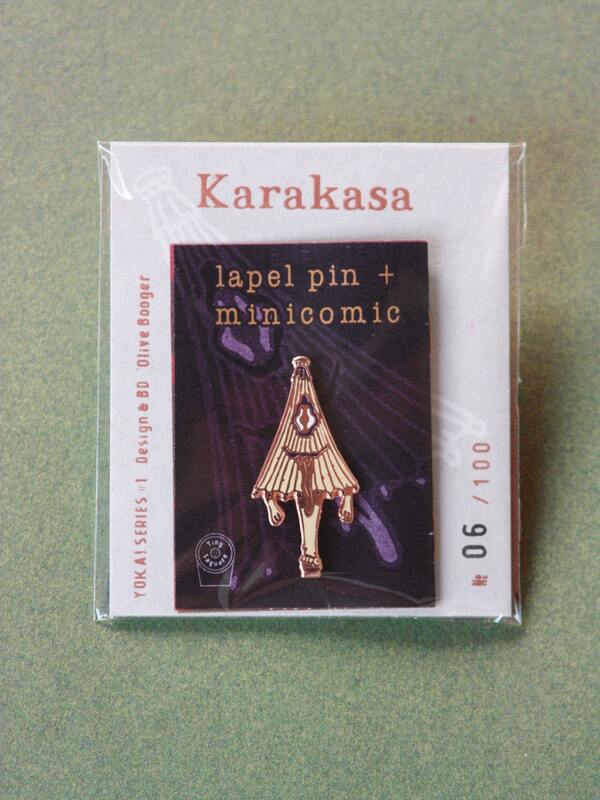 Arrived super fast and well wrapped... Can’t wait to pop him in my jacket next to my other karakasa pin! Thanks so much! 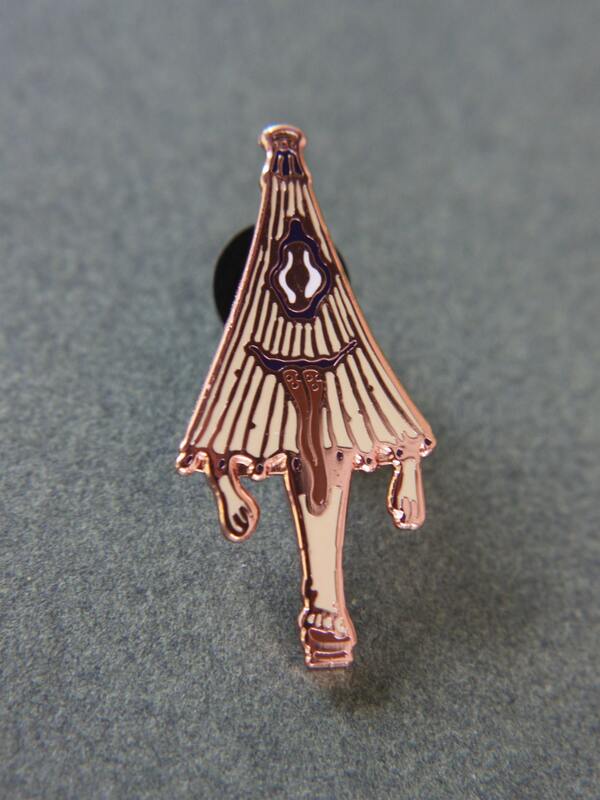 Such an awesome pin! Came with a dope little comic book and such a sweet personalized letter from Eleonore. I’ll definitely cherish this little guy for many years to come. The little comic is adorable, and I love the pin so much. Also A++ customer service - highly recommend this shop. Thanks again! parfait, l'emballage était tellement beau que je ne me suis résolu qu'à jeter l'enveloppe, le sticker en cadeau est très chouette lui aussi!